Recent developments in state-of-the-art extraction technology. Innovations with Ed Begley, Jr. will educate audiences on recent advances in extraction tools and technologies. This episode is scheduled to air Nationwide, 4th QTR, 2018. Check your local listings for more information. 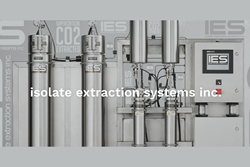 In this segment, Innovations will focus on Isolate Extraction Systems Inc. (IES), an experienced company dedicated to the manufacturing of safe, high-quality, food-grade extraction tools. With a behind-the-scenes look, viewers will learn how IES develops state-of-the-art technology and procedures with the goal of producing the most advanced, safe, valuable, and reliable equipment. IES equipment is certified in several municipalities for autonomous use, allowing for unattended overnight production. IES adds value through a common goal to provide clients with the best equipment and technology for the purpose of mutual success. Internally focused on a culture that encourages positive reinvention through collaboration has given IES the edge in an ever developing and rapidly growing industry. For more information, visit: http://www.isolatesystems.com. For more information visit: http://www.InnovationsTelevision.com or call (866) 496-4065.